On Capitol Hill, USA Gymnastics President Apologizes To Nassar's Victims : The Two-Way Executives from the U.S. Olympic Committee and the governing bodies of swimming, taekwondo and volleyball also testified about changes their organizations are making to protect athletes from abuse. 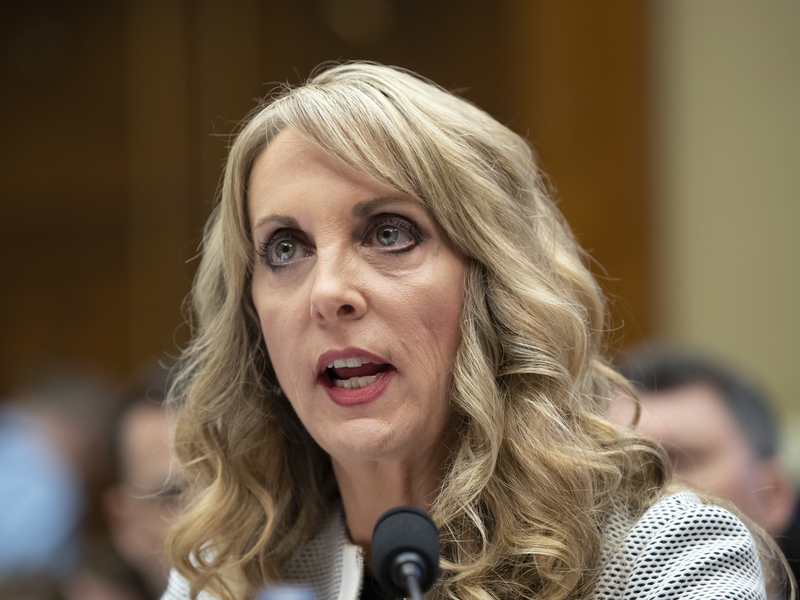 USA Gymnastics President and CEO Kerry Perry testifies on Capitol Hill on Wednesday about changes her organization has made to protect athletes from sexual abuse. Susanne Lyons, acting chief executive of the U.S. Olympic Committee, said her organization had taken steps to reform the system, including doubling its funding for the U.S. Center for SafeSport, which was created last year to prevent abuse in sports. "The Olympic community failed the people it was supposed to protect," Lyons said in her testimony before the House Energy and Commerce subcommittee. "I know that we can do better. We will do better." Lyons stepped in to lead the USOC on an acting basis in February when the CEO resigned, citing health concerns. Many of the House members' questions were directed at USA Gymnastics President and CEO Kerry Perry, who joined that organization in December amid a crisis over former team doctor Larry Nassar, accused of abuse by hundreds of women and girls. Kerry read a statement in which she apologized to the victims of Nassar, who was sentenced to decades in prison and will likely spend the rest of his life behind bars. "Like all of you, I was appalled and sickened by the despicable crimes of Larry Nassar. We must do better," she said. "I want to apologize to all who were harmed by the horrific acts of Larry Nassar." "I commit to you that I will keep their words and experiences at the core of every decision I make every day as the leader of this organization," she said. "Let there be no mistake: Those days are over. USA Gymnastics is on a new path, with new leadership and a commitment to ensure that this never happens again. Since December 2017, we have embarked on a mission to implement a culture that puts athletes first. To that end we are working hard to regain the trust and confidence of our athletes, their families, and all who are part of our gymnastics community." She listed a number of steps USA Gymnastics has taken in recent months, including closing its training center at the Karolyi ranch in Texas, aiding investigations by Congress and the U.S. Olympic Committee, USOC and congressional investigations, supporting a law to safeguard amateur athletes, creating an athlete task force, and expanding its SafeSport department. She said the organization continues to implement the recommendations from an independent review completed last year. Rep. Joe Barton (R-Texas) asked Perry why USA Gymnastics has not yet compiled the full number of complaints it has received about sexual misconduct. Perry said the organization didn't have very good data from the past, but that between January and April of this year, it had been contacted about some 275 cases. Of those, USA Gymnastics referred 78 to the Center for SafeSport. Last week, Michigan State agreed to pay $500 million to settle claims by the women and girls who say they were abused by Nassar. In April, the Indianapolis Star reported that USA Gymnastics was suing its insurance carriers, arguing that they have not provided a full defense or reimbursed it fully for its legal bills in defending itself in 10 lawsuits related to Nassar.